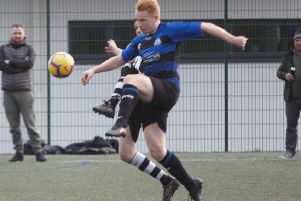 Ovenden West Riding’s match away to Toller FC at Thornton Leisure Centre yesterday was abandoned in the 85th minute with the Calderdale side trailing 8-2. Long-serving Ovenden official Steve Smith said home players and supporters had been outraged by a late challenge from an Ovenden player in the West Riding County Amateur League contest. It had led to a confrontation involving players from both sides and home supporters. Smith said the referee would now report the matter to the West Riding County FA and the score would not stand as a result at this stage. Ovenden had given another woeful defensive display, failing again to cope with the pace of the opposition on a 4G surface. The threat of the outstanding Kamran Khan was never dealt with. He notched four goals and was ably supported by Zakariya Daya, whose pace wide on the left was too much for the likes of Luke Simmons and Jonny Lamb. Khan put Toller 2-0 up in 10 minutes but a lovely move involving Luke Oldridge on the left gave Nathan Sloan the chance to reduce the deficit with a sweetly struck 18 yarder. Jordan Pettifor and Jamie Keegan helped Ovenden hold their own for long periods in the second half. Sloan made it 6-2 and Mohammed Khan added two more before the game was abandoned after the melee.